Syringa vulgaris is a shrub to 6 m tall, usually multi-stemmed, stems stout, somewhat sinuous, new bark shiny, brown, older bark gray, slightly shredding stems. Leaves opposite, egg to heart-shaped, to 10 cm long, tip pointed, base blunt to lobed, dark bluish-green, expand late April-early May (Britton, 1874). Flowers purple to white, 1 cm wide, tubular with 4 flaring petal lobes, very fragrant, early May (Britton 1874); inflorescence to 20 cm long, branched, an irregular, dense pyramid. Fruit a dry, persistent capsule. Habitat: Usually in edges of overgrown gardens, horticultural areas or old house sites. Not blooming in shade and eventually dying under closed canopy. Not known to escape in NYC Metro region. Notes: Susceptible to bacterial blight caused by Pseudomonas syringae resulting in die-back of shoots; fungal diseases include: Anthracnose (dark spots or sunken lesions with a raised rim) caused by Glomerella cingulata (Ascomycotina); powdery mildew, Microsphaera syringae (Ascomycotina) coats leaves with a mottled whitish-gray bloom (Agrios 1988). This is especially evident late in the growing season. ; Stressed or wounded plants are susceptible to sapwood rot caused by Trametes versicolor (Basidiomycotina), common turkey-tail bracket fungus often found on dead logs; common lilac is attacked by the lilac borer, Podosesia syringae, the larvae of a small clearwing moth (Lepidoptera) that tunnels in bark and wood. The larvae of the lilac leafminer, Caloptilia syringella, caused brown blotches on leaves. 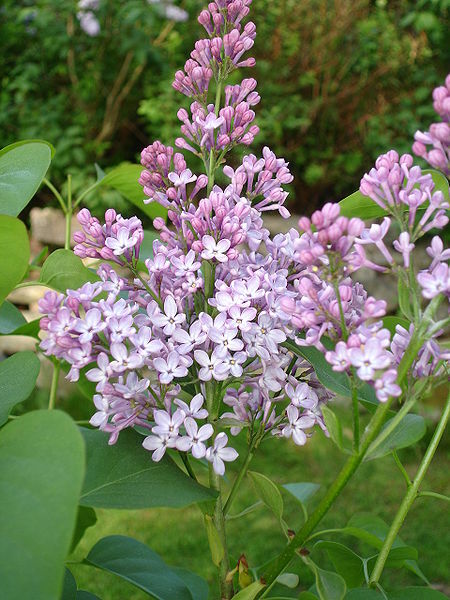 Lilac is also attacked by various scale insects including Lepidosaphes ulmi, ostershell scale (Homoptera, Diaspididae) (Borrer and White 1970; Johnson and Lyon 1991; Dirr 1990; Sinclair et al. 1987).